This product is available for sale in North America and will be stocked in St. Louis, Mo. 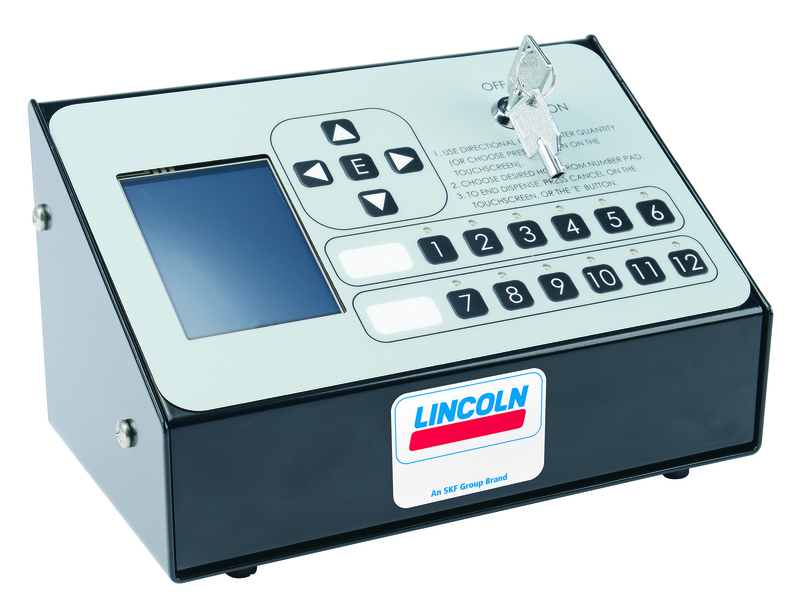 SKF today announced the introduction of its new SKF Lincoln LFC 612 fluid management system. Developed for vehicle service applications, this entry-level system dispenses engine oil, transmission fluid, washer fluid, antifreeze and diesel exhaust fluid (DEF). The LFC 612 is simple to install and easy to operate. No special training is required – simply plug it in and begin using it. The system manages one fluid to 12 hose reels or two fluids to six hose reels each. Its touchscreen LCD shows the amount dispensed and also has memory of the last three entries plus three quick-select quantities defined by the operator. Specific values also can be entered. Activating one hose at a time, the LFC 612 uses a pulse meter at the tank for each fluid and a solenoid for each dispense station or hose reel. An optional air solenoid may be added as a safety feature so that the pump will not move fluid unless the system is activated. This minimizes spillage in case of a hose rupture. The LFC 612 dispenses in pints, quarts, gallons or liters and operates effectively in temperatures ranging from 32 to 122 °F (0 to 50 °C).